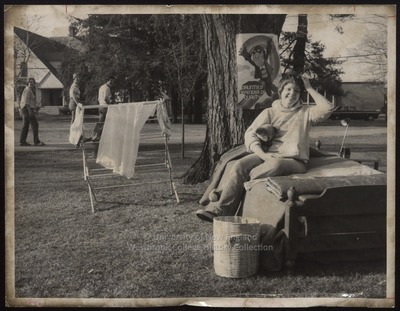 "Lynne Blaisdell Sits on Her Bed on the Campus Green, Westbrook College"
Westbrook College student Lynne Blasidell, Class of 1976, was in the Nursing program and lived in Goddard Hall. She poses on her bed which has been removed from her dormitory room and placed on the Campus Green, along with her bedside table and reading lamp. Her laundry basket rests on the ground at the foot of her bed. Her nightgown hangs from a portable clothes bar; and a Bud Man, Dauntless Defender of Quality, poster is tacked to a tree trunk at the head of her bed. Lynne's bed is neatly made, and she perches on it with her teddy bear securely linked under her arm. In the background is Alexander Hall and three students headed toward the dining hall. On the reverse of the sepia toned photograph is stamped "Press Herald, Thu Apr 22 1976."